First and foremost, thank you so much to whoever purchased through my referral link last month. I was able to earn enough Glossydots to get this month for free! If you are not familiar of Glossybox, it is one of six monthly beauty subscription service that is available in Canada. If you stumbled upon this post because you are still researching on which monthly beauty box to subscribe to, hopefully my posts will help you with your decision. I've done more thorough blog posts on the background of each subscription companies before, so if you're interested in checking those out, please click here. So it is literally the end of March and everyone finally received or in the process of recieving their beautiful pastel pink box. Apparently some of the items were held up in customs, which was why there was such a massive delay. To show their sincerest apology, Glossybox offered their members 250 Glossydot. I really appreciate how they responded to this situation and how they had constantly gave us updates on what was happening. The bonus Glossydots were just enough for me to earn next box free as well. I'm really excited! I am back with another nail art tutorial for you! This nail art is inspired by Mulberry Ready-to-wear Spring/Summer 2012 collection that was showcased in this year's London Fashion Week. Since we're in our first week of Spring, I really wanted to a lot of spring colors. 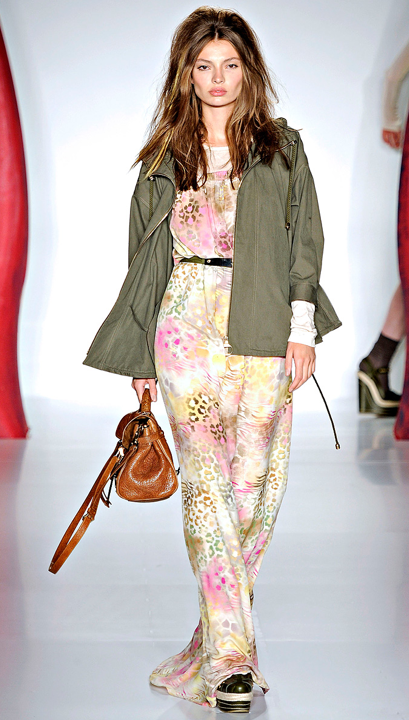 While browsing through Vogue's fashion show archives, the Mulberry show caught my eye. As soon I scrolled through the various images, this beautiful multi color leopard print dress received my immediate attention. I love how it has a mixture of different prints, zebra stripes and leopard print, as well a beautiful watercolor looking background. If you want to learn how to replicate this look, please continue reading! It has come to my attention that one blogger's recent blog post is apparently VERY similar to what I wrote a week and a half ago regarding Beauty Box 5, one of the newer beauty subscription service that is available to Canadians. I didn't want to accuse her of plagiarism right away, so I had several secondary opinions to see if I am not the only one seeing these similarities. Everyone that I asked to compare said that it was extremely similar but in a more condensed version. So similar, that she even titled the post the exact same way as me, almost formatted the same way, mentioned the companies in the exact same order, made the exact same points and expressed the same opinions regarding the independent brands and packaging. "The brands that were featured in the launch box included: Weleda, Smith's, Comodynes, Priti NYC, and Personally. I have hear of maybe 2 of the 5 brands in this box. I feel that is an awesome idea for Canadians to try out this box considering the products being received maybe that of something we dont even have here or have heard of here!" "The brands that they featured in the February inaugural box were: Weleda, Smith's, Comodynes, Priti NYC. Personally, I have never heard of any of these brands. I feel that the cosmetic industry in the US is much more competitive and saturated, so there are a lot more cosmetic companies out there." She must of thought that "Personally" was a brand from reading my post, where as I used the word "Personally" to express my experience and opinions. I pointed this mistake out by commenting on a post she made in the Beauty Box Review Facebook group. I just want to say that if you're going to take people's ideas and pass it off as your own, I hope your changes are drastic enough so copying doesn't seem so obvious or at least give them the credit that they deserve. I'm starting to wonder if I'm the nameless "Facebooker" she mentioned in her post. Perhaps I'm overreacting, or maybe it's wrong of me to write a post about this situation, but this just doesn't sit right with me. I wouldn't care if it was was 50% similar or 75% similar. The fact is that in my eyes, being the originator of the post, it's at least 95% like mine and I'm not the only one that sees that. I wouldn't mind if she kept her post up, but it would be nice if she showed some acknowledgement that she did take some points from my post. Anyways, let me know what you think. Is it a coincidence that it's so similar or do you think she might of copied and condensed? Update: Apparently this isn't the first time (so that answers my question). Update: She apologized and credited me and Aleeza as a sources in her respective posts. I appreciate her acknowledgement and I hope this doesn't happen again. My experience with Luxe Box this month has been less than impressive. It all started with their First in Line program, where subscribers can reserve one of the featured product. We were able to choose between a Cargo Eyeshadow, Cargo Glitter Liner, and some other product that didn't really stand out to me. Previously the first in line notification came as a surprise and it was on a first come, first serve basis. Some people complained that they miss out on it cause they don't check their email until later on in the night. This month, Loose Button decided to notify their subscribers about one or two days in advanced, specifying the exact time to start reserving. Instead of choosing an item through your email, they wanted their subscriber to log into their accounts to pick an item instead. Clearly their intentions were good, but to me it honestly did more harm. When you notify all 8,000 plus subscribers, it would mean a couple hundred people (if not thousands) would want to all log into their accounts at the same time. This created a bottleneck, because since they are not a tech company, their servers couldn't handle that much traffic going into their website. A lot of people, including myself, were not able to log in and kept getting an error message. I didn't have the patience to wait half an hour to reserve left over products that I really didn't want. I also tried to push my luck by not reserving anything, because in a previous month I missed out on First in Line reservation and still received the item that I wanted. This month, I guess I wasn't so lucky. So it's Loose Button's first year anniversary! Happy Birthday Loose Button! As a token of their appreciation that gave us a thank you card embedded with seeds. You can actually grow these seeds into a plant. Very timely considering it is the first day of spring! I've studied a lot of paper and ink back in the day when I was still student in Graphic Communications Management program. I've only heard about these types of papers but I never seen one first hand. It's quite intriguing. I'm definitely going to try and grow it. But every year that I try to grow herbs from little seedlings, it has always been a total failure. So if you're still not familiar with Julep Maven it is a very simple concept. It's similar to Luxe box, Glymm, Topbox etc. if you're in Canada and Birch Box, Beauty Army, MyGlam if you're in the United States. The only differentiation is that they are Julep based brands and they center around nail care items, mainly nail polishes. From what I have seen, every month they feature a unique product. In past months they featured hand creams, hair spray, argon oil, lip gloss etc. What i love about Julep Maven is that you get see what's going to be inside the box before you decide. You can Peek into an upcoming box, skip a month, or try out a new style. I have written a couple of posts about Julep Maven, so if you're interested in learning a little bit more please feel free to browse around my previous posts. Being a nail polish addict and subscription box junkie, I absolutely love this service. Julep also has this amazing promo where you can get your very first box for a penny. When you fill in their style quiz, type in one of the MANY penny promo codes: SHAREONMARCH or COLOR2012 or PENNY to reduce the price from $19.99 to $0.01. For Canadians, it's actually literally a penny. But as for our American friends, there are applicable taxes but it is still under $2.00. While browsing around Facebook, I stumbled upon a new beauty box subscription service that is based in the US. Like Julep Maven, Beauty Box 5 ships to Canada as well. Have any of you received your February inaugural box? What do you think? 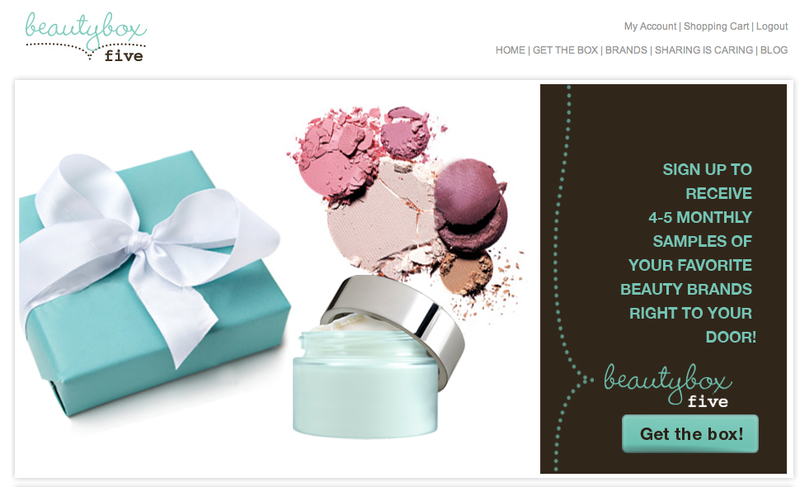 If you aren't keeping track, this service marks the 6th beauty box subscription option available to us Canadian girls! There are Luxe Box, Glymm, Topbox, Glossy Box, Julep Maven, and now Beauty Box 5. 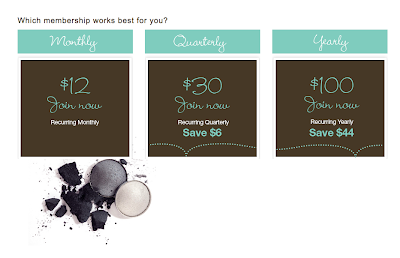 As of right now, I have a subscription to Luxe Box, Topbox, Glossy Box, and Julep Maven. I will most likely cancel my Glossy Box subscription just because four subscription is a little excessive. Loose Button: Sign Me Up! Glossy Box: I Want One! *For more comprehensive review for all the available beauty boxes in Canada, please click HERE. The subscription is US$12.00 a month including tax and shipping or $30 for 3 months ($10 a month) and $100 for a year ($8.33 a month), which is about the same in Canadian currency. Like Loose Button Luxe Box and Glymm Box, it comes with 4-5 beauty samples, presumably deluxe to full size. First subscription of the month! I just checked to see if the PENNY code was still active and good news it still is! To get your first Julep Maven box for $0.01, simply click here or my referral link below, fill in the quiz and type in the code COLOR2012 or SHAREONMARCH and it should reduce the price from $19.99 to $0.01! I was assigned the profile "Classic with a Twist", but this month after I saw the sneak peek for Julep's March Maven box, I decided to switch to "It Girl". I really liked the Salmon color in the Boho Glam box, but I wasn't total fan of the light blue glitter and I didn't really want the Aragon oil, so I opted for the It Girl box. I am extremely happy with my choice! My nail art isn't lasting very long, so here's another one! This nail art is inspired by Elie Saab Couture Collection for Spring 2012. If you haven't seen this collection yet, you should definitely check it out! It is absolutely drop dead gorgeous! There are a lot of pastels, florals, and sparkles, which I'm pretty obsessed with. Anyways this is my interpretation to one of his designs. I hope you like it! This is also my entry to contest on Enamel Girl's Blog. So today's nail art came from the new Louis Vuitton 2012 Ready to Wear Spring Collection. I was immediately attracted to this collection because of how whimsical the designs were. 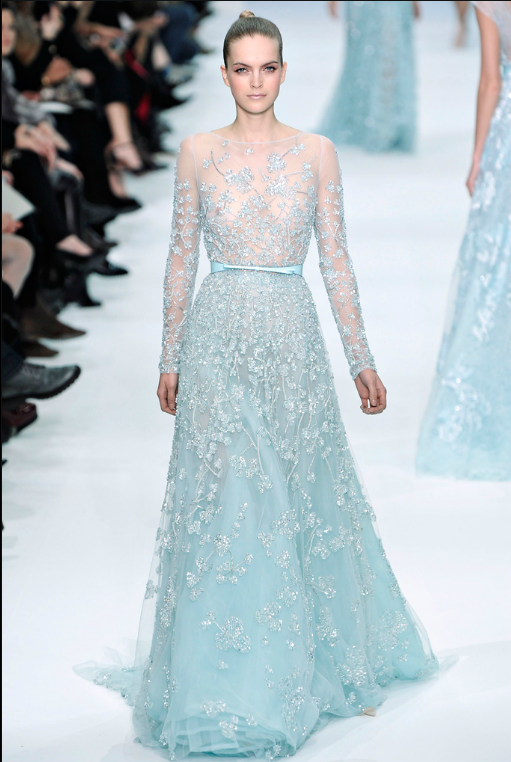 There were a lot of pastels and florals used throughout the collection. At first, I wanted to do one of the yellow designs, but my yellow polish was really thick and the application became very streaky. I have another yellow polish, unfortunately it wasn't the right shade. It was light and translucent while I needed bold and bright. Anyways the outfit that I ended up choosing from the collection had four colours, light blue, light pink, white, and tinted green. I'm in love with the floral cut outs in all the designs! I own darker shades of pastel polishes compared to this dress, so I had to mix my own colors to lighten it. I think I could of gone a lot lighter, but I think it's close enough. I painted my index fingers and my ring fingers white just to break up the design so it doesn't look too busy and it also saved me a lot of time! The white also represents the white sleeves of the outfit. Anyways onto the tutorial! I finally found the inspiration to do my nails! It chipped last week, so it's still pretty short, but I think I made it work. This nail art was inspired by Derek Lam Printed Full Skirt worn by Serena Vander Woodsen in this week's episode "The Princess Dowry". I really like the details of the pattern and I didn't think it was that hard to replicate. I also tried out a new technique to achieve the perfect patterned circle, so if you want to know my little trick just keep reading! It's really hard to center the patterned circle on every nail, so I just worked with the imperfections. I think since they don't all the same, it gives it a little dimension like the movement of the skirt. This design also reminds me of the Mayan Calendar since it's circular with a lot of fine details. So you can also call this Maya Tribe inspired nail art too! I think next nail art I might try is going to be a more colourful version of a Mayan pattern, so stay tuned for that!